I braced myself as I saw another article on bicycling in the Washington Post. I was expecting press coverage of bicycling akin to what I have documented in a previous article. In separate opinions Washington Post columnists didn’t want to see bicycles either on city streets or on its sidewalks. I guess that means bikes and their riders should float like angels above the traffic leaving the roads and walkways to cars and pedestrians. But finally in a January 2017 article the Washington Post began to catch up with the bicycle boom. The title of this article asked the question, “Is biking stressing you out? Here’s how planners are trying to make things better.” The article has a clear pro-bicycle tone, and makes the point that it's important to connect neighborhoods severed by major thoroughfares. Another article gave guidance on how to get around by bike on for events at the inauguration day of Donald Trump. This news column from Dr. Gridlock had the headline “Biking is a good option for inauguration and the Women’s March, but there will be challenges.” It was nice to see some positive press coverage by the Washington Post. The first article stresses that the neighborhoods in Washington, DC are ideal for bicycling. The traffic is slow because of 25 miles per hour speed limits. The streets sometimes are narrow so cars and trucks are accustomed to waiting for other vehicles to pass before proceeding down the street. The result is that cars and trucks pass slowly through the neighborhoods expecting to have to wait and stop for obstacles. This means that on neighborhood streets bicycles and pedestrians can mix with motorists with few problems. Generally everyone is courteous to one another. Unfortunately, this is not true of other city streets. Most neighborhoods are severed by busy streets. In Washington, DC many streets are called avenues and they are named after states such as Massachusetts, Indiana or Wisconsin. Most of these roads are 4 lanes with speed limits of 35 miles per hour. The traffic lights are timed so that cars can breeze through them when traffic is light. Many commuters use these arterial avenues. Going and coming from work motorists are impatient and sometimes cranky. During my bicycle commuting years I rode straight down Massachusetts Avenue, easily keeping up with cars. But for most people unaccustomed to riding in traffic, these busy thoroughfares can be daunting. As a consequence, for all but the most fearless bicyclists, roads with high traffic volumes are a barrier for bicyclists and pedestrians. They slash through and isolate local neighborhoods. Washington’s District Department of Transportation has recently published a map to make this point. As can be seen from the image, the matrix of safe streets appropriate for children and cautious adult bicyclists are separated by major roads and highways. The Washington Post article makes the following point concerning what is revealed by the map. The problem: Areas that offer comfortable rides are often cut off from one another by high-stress roads that don’t have a convenient, safe crossing. That leaves what planners call islands of safe cycling routes, which often don’t lead anywhere and make biking to school, work or the store unrealistic for most children and adults…Providing comfortable connections appears to be particularly important in attracting more women and older riders, planners say. The map is not perfect. 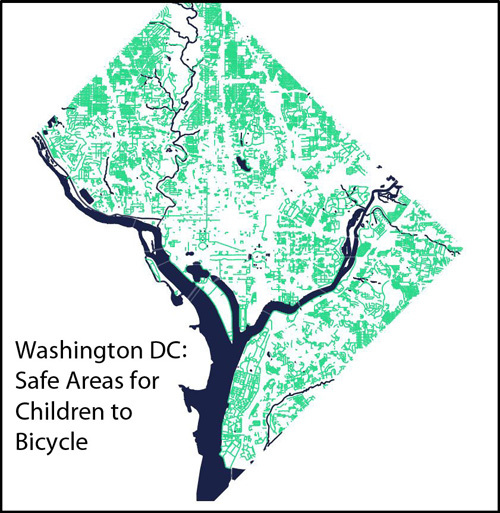 Later in the Washington Post article the Washington Area Bicyclist Association is quoted as saying that some of the sites on the map deemed to be safe really need improvement. As a case in point, the L and M Street bicycle lanes--among the first in Washington, DC--dangerously mix cars and bicycles at intersections and almost invite parking by delivery trucks in bike lanes. Recently there is an initiative by the National Park Service to connect regional paved bicycle trails. 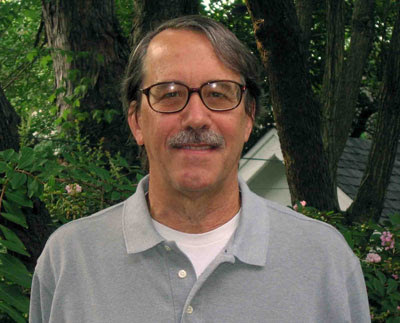 A recently formed non-profit organization called the Capital Trails Coalition is coordinating the effort to connect the region’s trail. Connecting trails is a good idea, but connecting neighborhoods is also important. Not only are the major arteries in Washington, DC a barrier to bicycling across neighborhoods, but the main intersections crossing these four lane thoroughfares are often quite crowded. It is good to see that the DDOT after concentrating on downtown bicycle lanes is now beginning to expand their reach to safe bicycling in the neighborhoods. Connecting both neighborhoods and regional trails to improve bicycle and pedestrian safety is a good idea whose time has come. Luz, Lazo. 2017. "Biking is a good option for Inauguration, Women’s March but will have challenges," Washington Post January 21. National Park Service. 2016. Paved Trails Study. National Park Service, National Capital Region, Washington, DC. Shaver, Katherine. 2017. "Is biking stressing you out? Here’s how planners are trying to make things better," Washington Post January 21.